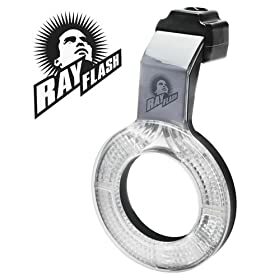 It is obviously knock-off of original RayFlash. I do not know quality of it but it costs $60 instead of $200 and looks almost identical. Rayflash, on the other hand, seems to be infringing on Kodak's patent (#20060093344). Recently i had received the RayFlash as a gift. After 10 days i sold it on ebay! If you are looking for a ring flash, then it's better to by a real ring flash. These things are too heavy for the hotshoe, plus they eat a lot of light (more than 3fstops). i have done good with my Orbis. I got o-flash, which is similar to this, and it costs about 30-something dollars. And it works great for macro, and with closer subjects. Do you also find the results shown in the end "the same"? I find the lighting in rayflash very flat. For the record: I have never shot with a ring flash before and I have the following question. When you take the set-up like in the youtube video posted by Leaf above and you're approx. 12-15 feet away from the model using a flash that has a 15 inch diameter with a hole in the middle, don't you always get nearly the same result as shooting with a regular flash? My point is, that at this distance, how is it possible for the light (being such a "small" light source) to illumante the model any different than using a speed light mounted on the top of the camera? Of course the speed light is even a smaller light source but that could be compensated with some MacGyver tricks or using one of those inflatable "softboxes" for the speedlight in order to diffuse it some more/create a larger light source. I originally though that a ring flash only really shows its characteristics when shooting close-ups and where you can actually see that distinct ring reflection in the eyes or (sun)glasses of the model. Other than that I wonder how the ring flash makes this shoot or this kind of lighting so special when we consider the distance to the model and the relative size of the light source. I also thought ring flashes were for macro/closeup, but then I don't shoot studio, so I have no idea. I assume that there IS a difference. My question is if that difference is worth the money specifically in this case when shooting from so far away? No doubt that the closer you get, the more distinct ringflash-look will appear - I just don't get why this guy decided to compare this type of flash from such a big distance The size of the light source becomes so small relatively to the subject, so what's the point of using that instead of a beauty dish or even a soft box maybe? The main thing to keep in mind about this vid is that this guy is making a comparison of a strong light source unit vs. a weak light modifier being bumped to a ridiculous ISO .. kinda a stupid comparison IMO. He's also using the ringflash in the "new trendy" way of using it .. I'm a fashion photographer who stands over a dozen feet back from my client and makes comments about needing to be able to fire a shot every 2 seconds (lame) .. at least he did mention the fact of using it as a fill for full length fashion portraiture because that's the only time it makes sense to use one in that situation. And yeah you're right it makes much more sense to use them in macro work .. after all they were designed specifically for dentists to be able to produce evenly lit flat light images of their patients chompers. You also nailed it on it being used to create the catchlight. All stock aside ... Ring lighting for portrait clients is much more profitable if done using a continuous light source for maybe 1-3% of the session. A couple fast headshots to show off the catchlights then move on to other things. You can assume a guaranteed sale on a ringlight shot 95% of the time .. but normally only on 1 pose .. so you make it a headshot, fire a couple off and continue on to other things that will produce more sales. Just look at the guys portfolio .. he primarily takes snapshots of celebrities. LOL ... A good lesson that backs up the fact that modern photography is about marketing & location ... everything photography comes in a distant 2nd .. or 3rd .. or hell who knows anymore. I doubt it's worth buying if you already have a softbox, for the purpose you mentioned. The reason the ring flash creates a different look than a speedlight or on camera flash is because it is all around the lens. A speedlight creates a very hard dark shadow on one the side of the object which is not flattering. A ringflash would also create this hard dark shadow because of it's small size, but there is light on every side of the lens so it fills in the shadow with more flash. It creates shadows and fills in the shadow on all sides. I get the point of having light from all sides around the lens which is a great benefit when shooting close-ups. I couldn't wrap my mind around this guy's tutorial, using a flashring from such a big distance. He has to pump quite some light out of that flash to expose the model properly. At the distance he used the flash ring will also create a rather harsh light compared to using it 1 or 2 feet away from the model's face with way less power to get a more even lighting, which will be worlds better than a speedlight of ocurse. 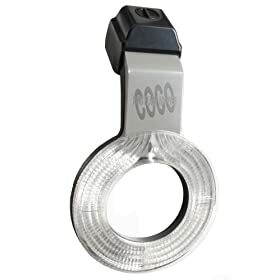 What can you tell me about the Aputure Amaran AHL-N60 Halo Ring LED?